We are a chickpea fan and chickpea curry appears very often on our table, love the addition of spinach, it adds lots of nutrition and flavours. This looks hearty, healthy, and delicious. I love that it comes together in 10 minutes too – can’t beat that! As quick, easy and tasty as advertised. We had this dish today and absolutely loved it! It really takes no time and is easy to prepare. 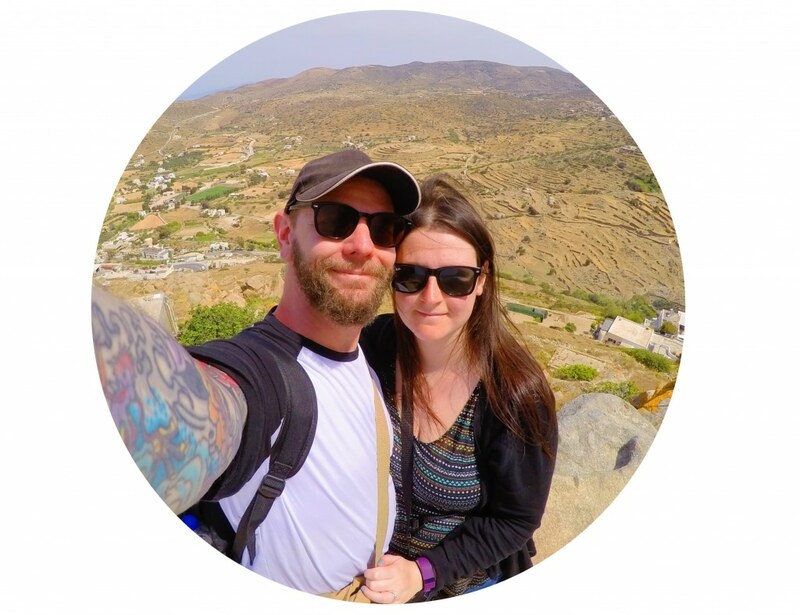 We are so glad you enjoyed it – thanks so much for coming back to let us know! I am thrilled that I stumbled into your blog. Our family loves Indian foods and they will do anything I ask (chores etc.) if I will fix Indian food. These from scratch recipes are going to make them very happy. In the past we have used boxed mixes, but your recipes will be so much fresher. Thank You for what you do. 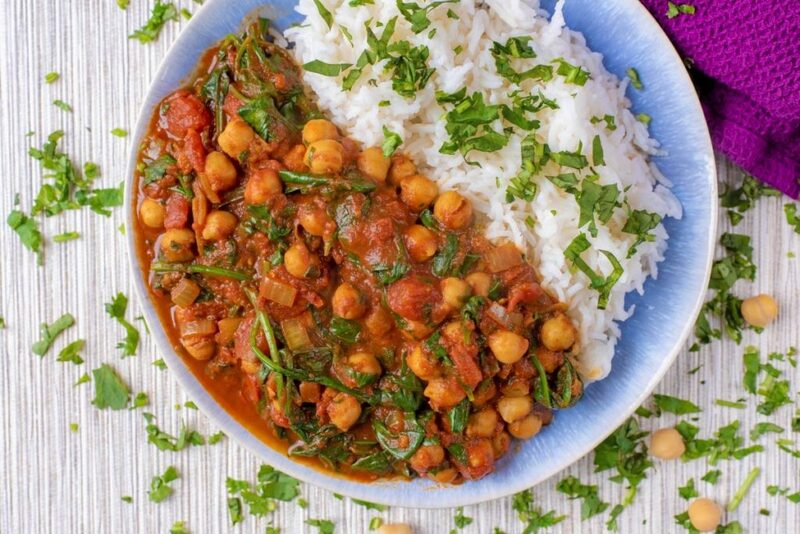 I like to cook chickpea curry a lot this looks like a fab recipe. 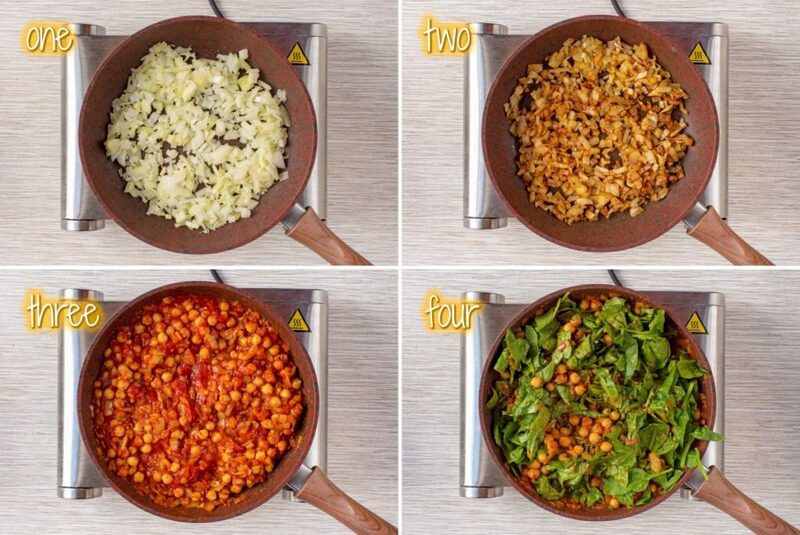 I love using chickpeas in recipes. This looks like the perfect busy weeknight meal. 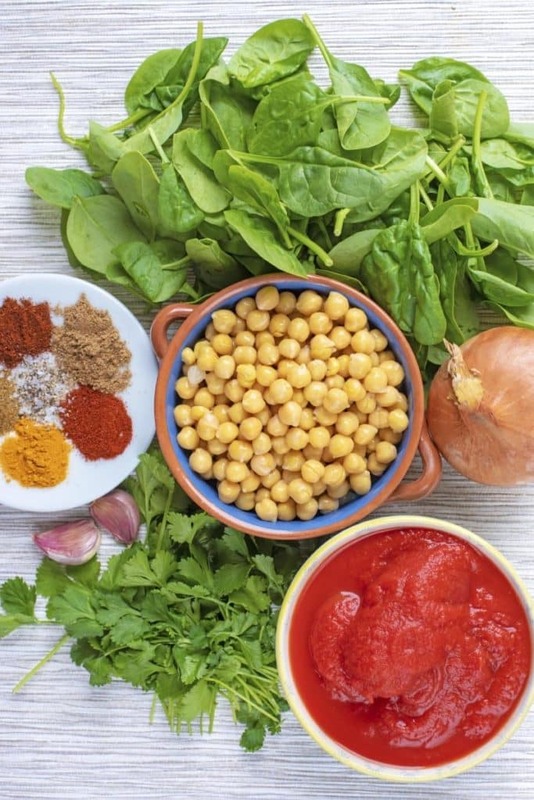 Healthy, nutritious….and who doesn’t love curry? Such a light, easy meal! I used to make something similar on a regular basis and need to continue doing that. 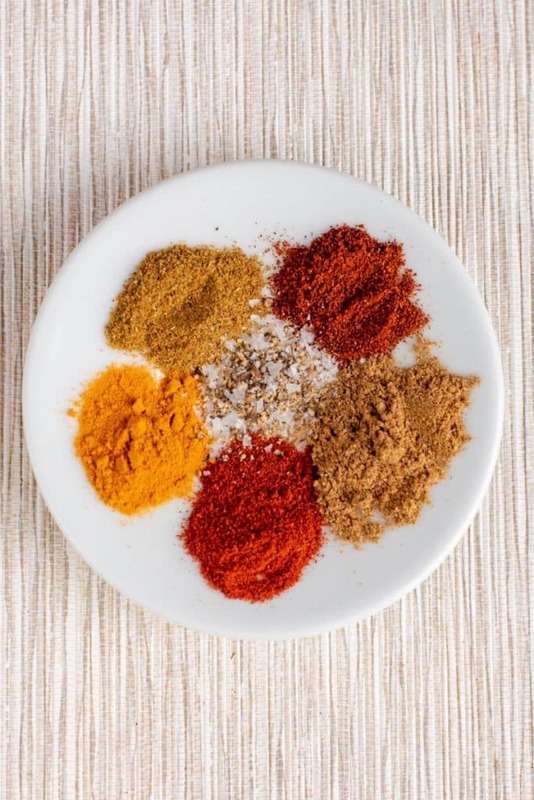 I’ll have to try yours…I love your spice combo! I love chickpeas, but I seem to never use them in my recipes. 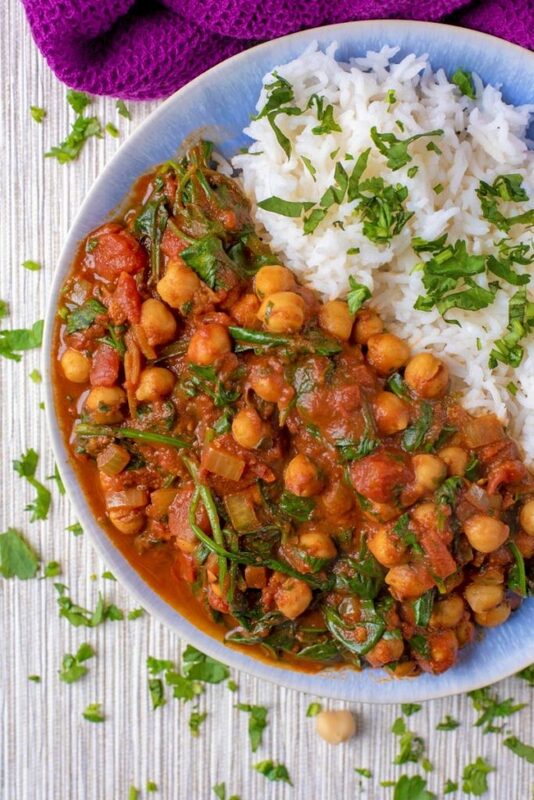 Thank you for sharing this awesome recipe that makes chickpeas the star! This reminds me of a dish I used to eat when I lived close to Fairfield, Iowa. It brings back memories. I can’t wait to try this out! This is such a great recipe for a busy evening, I usually have some frozen spinach so I could easily use that instead of fresh! 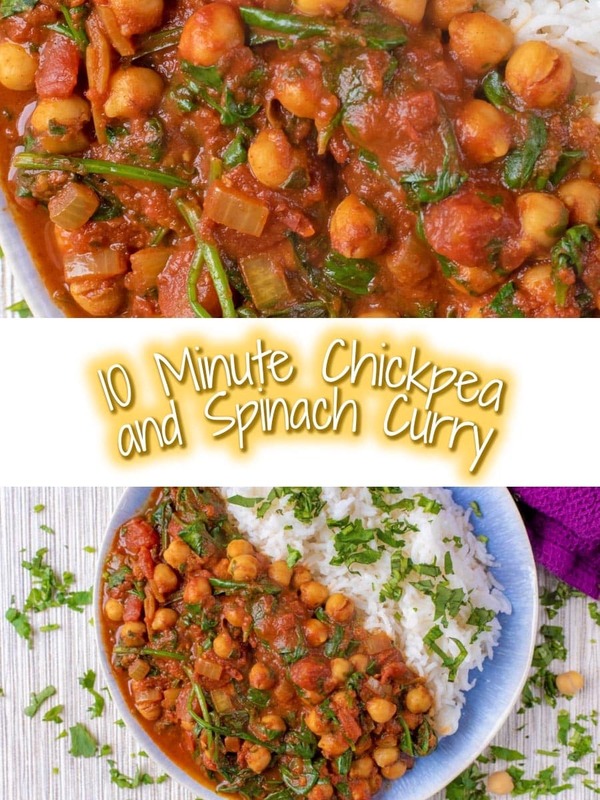 I love chickpeas and with spinach this is a bonus with spinach and 10 minutes wow! thanks awesome! Wow! Tried this last week and wasn’t sure something so quick, so easy and with limited ingredients could be so tasty. I was wrong! I loved this so much! Best veggie curry I’ve ever made! Will be a regular dish in our house now. Have recommended it to everyone I know! Thanks for coming back and letting us know. I’m so glad that you enjoyed it. It is super delicious nutritious and quick to make! Amazing job there! I love how quick this dish comes together . The spice combination is also amazing. Can’t wait to try this one soon. 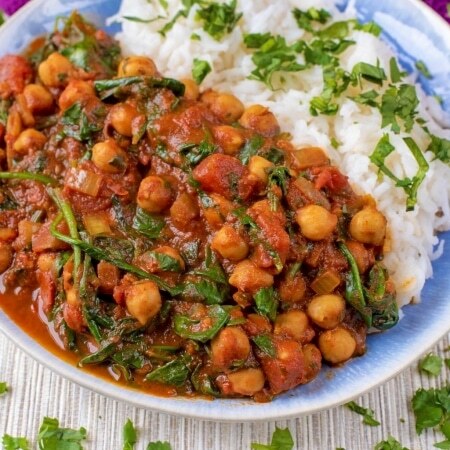 I love the addition of spinach to this dish – it’s such a tasty and healthy dinner. I love the spices in curry but have never attempted to make something like this. This looks hearty and delicious. Making this for a weeks lunches. Adding Cauliflower rice and oyster or bella mushrooms, not sure which yet, but it looks amazing and I forgot to buy protein for lunches this week but have chickpeas. Gotta love it. I make something similar to this, but add fresh cauliflower for a bit of texture. I find that a little squeeze of lemon juice really helps to brighten the flavors, as well. Ooh, thanks for the tip! I will give that a go next time.